Yahtzee is a successor of Yacht and played like many other similar games such as Generala, Cheerio, Poker Dice, Crag, Yatzy etc. Yahtzee has become the most popular dice game among sequence dice-casting games. The game is a trademark of Hasbro, Inc. The game has 13 categories to score which are divided between two sections; UPPER SECTION and LOWER SECTION. Each category can be scored only once. Categories can be scored in any sequence. There are 13 rounds in the game. Players can score in one category in each round. Players take turn to roll 5 dice in each round. After each roll the player can set aside one or more dice and then roll remaining dice. A maximum of 3 rolls are allowed to all players in each round. All five dice are available to be thrown anytime in a roll including the ones which were set aside in previous rolls. UPPER SECTION has a bonus of 35 if players score 63 or more in it. 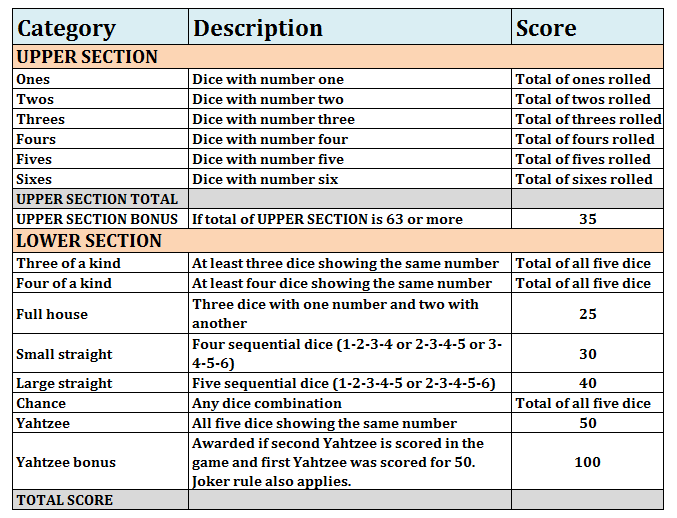 There is a separate Yahtzee Bonus awarded in LOWER SECTION provided certain conditions are met (read on for further explanation). Some combinations can be scored in more than one category. For ex, a Full house can be scored in Full house, or Three of a kind, or Chance. Large Straight can be scored in Small straight. Yahtzee combination can be scored in Full house as well as Yahtzee. Though as per the official rules Yahtzee cannot be scored in Full house category. This rule can be predetermined by the players at the beginning of the game. When players roll all five dice showing the same number, it is called a Yahtzee. In case players roll a Yahtzee second time, then additional points are awarded to the players provided following conditions are met. Players can get Yahtzee bonus only if the first Yahtzee was scored for 50 points. If the player has marked Yahtzee category for zero points, then Yahtzee bonus is not given. When player rolls second Yahtzee, it can be played against any category which has not been played yet and irrespective of whether or not player can score in that category, Yahtzee bonus will still be awarded as long as the first Yahtzee was scored for 50 points. There are specific rules on which category to play in this scenario. If corresponding category in UPPER SECTION is not played yet, then that must be played first. For ex, if 1,1,1,1,1 is rolled, it must be played against Ones category, if that is available. If corresponding category in UPPER SECTION has already been played, then one of the LOWER SECTION categories must be played. Full house, Small Straight, or Large Straight can be scored for 25, 30, or 40 points respectively even though its not a valid combination for these 3 categories in normal scenario. In this case Yahtzee combination acts like a Joker. If corresponding UPPER SECTION category and all LOWER SECTION categories have already been played, then remaining UPPER SECTION categories can be played for a score of zero.